Music, art, food, beer, sports, adventure, and fun await you in Jacksonville on any given day, and the best part? We guarantee it won’t break your bank! So come visit Jacksonville, and discover the new old Florida! Peddle along 14.5 miles of tree canopies on the Baldwin Trail. Stop for a picnic or visit Camp Milton to explore a little history. First time visitors to Bold City Brewery get a free beer flight to sample all of their tasty brews. Sample tasty treats, listen to live music, browse through local crafts, and mingle with the locals at the Riverside Arts Market in the historic Riverside neighborhood. Go for a run on the bridges! Two of Downtown’s five bridges have pedestrian walkways perfect for a jog, a run, or simply a walk. 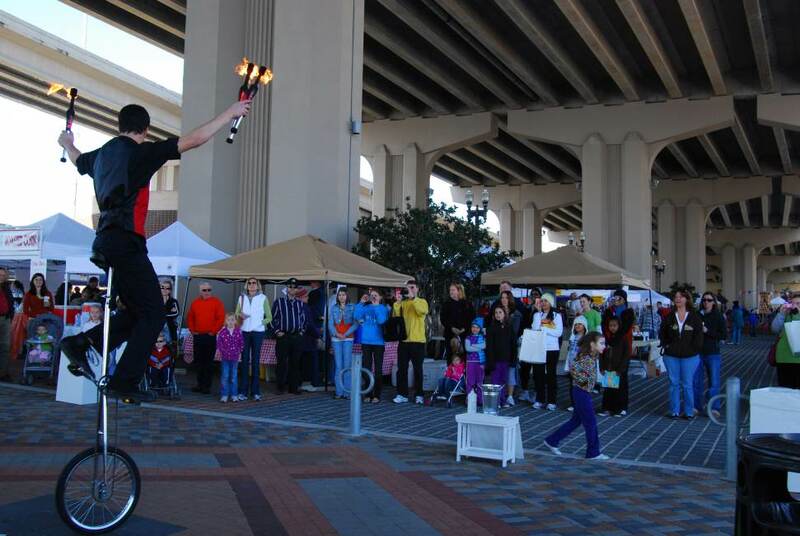 Check out Jacksonville’s newest festival, One Spark. Artists, entrepreneurs and innovators display projects in a 20-square-block, multi-venue gallery in downtown Jacksonville, where the community gets to choose what’s the next best thing. Visitors never know what they’ll come across. Hit the beach for a game of bocce ball or volleyball with friends, an invigorating run or a romantic stroll. Pick your spot for the perfect selfie. With so many waterways and beautiful green spaces, you’re sure to find a great place to snap photos, including Friendship Fountain in downtown, overlooking the St. Johns River and the city skyline. Be sure to use the hashtag, #OnlyInJax. There’s no cover at any of the lounges and bars on the King Street Food and Beer District. Listen to live music, dance the night away, or simply hang out with your new best friends. Catch a movie, during the summer free movies are showcased at the Sea Walk Pavilion in Jacksonville Beach. Grab a lawn chair and enjoy a movie date under the stars. Start planning your budget-friendly trip to Jacksonville today!